Ratzinger chosen as Pope, relativists and apostates hardest hit. when government behaves amiss, it’s duty that we owe. dissent is then incitement, if not blasphemy and crime. Since I can't draw . . .
A straggle of pathetic, half-naked Africans: women, children and grandparents. Some children with the telltale bloated bellies of advanced starvation, all of them with huge Precious Moments brown eyes, and flies on their faces. In the foreground, a water buffalo skull lies in the dirt, bleached by the searing rays of the equatorial Sun. The caption reads: ?For only eighty-seven cents a day ? less than the price of a cup of coffee ? you can provide twenty-three starving families with stuffed Tabby Cats, so they can die with dignity.? George J. Felos, the creepy attorney for Michael Schiavo, who kept a straight face while reciting Orwellian descriptions of how good starvation looked on Terri Schiavo, including the unlikely detail that Terri was looking peaceful and holding a stuffed tabby cat, has inspired me to coin a phrase. I hereby propose the term "Tabby Cat Apologist" to describe those low-lifes who go about making excuses for evil. What does Congress have to do that is more important than the precise reason for which governments are instituted among men? Namely, to secure the God-given unalienable rights, which include life ? but do not include the right to kill your wife. The Terry Schiavo case is Kevorkian v. Jefferson, and the Courts have come down emphatically on the side of Kevorkian. To be a liberal, you must be able to simultaneously believe that every elected official in the State of Florida, and the U.S. Congress is acting purely out of self-interest, and Michael Schiavo is acting purely out of altruism. Whenever I saw a TV Commercial for World Vision, Feed The Children, Compassion International, etc... ? you know the ones, with the little brown children with their Precious Moments eyes, flies on their face, and bellies bloated from starvation ? I would feel a pang of sorrow for these poor unfortunates; but, no more. This week I learned that starvation is a dignified AND pain-free way to die. So, why can?t we just allow all those starving little third-worldlings to die? After all, what kind of quality of life do they have to look forward to? Why should we take such extreme, costly and inefficient measures to keep them alive? I would like to hear the people so anxious to do away with Terri Schiavo provide a rational explanation for keeping these children alive, or for keeping anyone alive, when they become inconvenient to somebody. Over the years, concerns, protests and lawsuits about the manner in which the death penalty is inflicted on convicted murderers has led most States to replace the electric chair with lethal injection, as a means of administering death humanely. It now turns out that the fuss and expense of lethal injection is unneccessary. What we have learned from the Terry Schiavo case is that we can humanely rid ourselves of condemned prisoners without killing them. Instead of killing convicted murderers, we will simply "allow them to die" by denying them food until they starve to death. What is one to make of the Democrats' reactionary -- almost idolatrous -- defense of the Social Security status quo? Perhaps today's Democrats are playing a variation on a Clinton theme; Harry and Nancy and Teddy and Howard are Building a Bridge to the Twentieth Century. 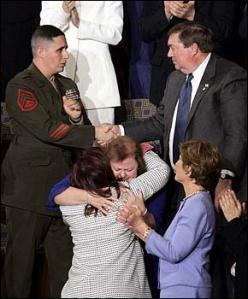 How unfortunate for Terri Schiavo that she was not wounded on the battlefield, fighting against American Armed Forces. If she had been, the same people now clamouring for her death would be defending her rights to TLC and every creature comfort. Is Affirmative Action a victimless crime? What information do you suppose the Associated Press (and most other MSM) is SUPPRESSING about the shooting of a judge and several other victims in Georgia? If the Public has a “right to know” that guards at Abu Ghraib were mistreating prisoners, why doesn’t the Public have a right to know that the sheriff’s deputy who’s gun was taken was . . . a woman !!! Of course, it is heretical to notice that a 100 LB girl is an easy mark for a monster like this Brian Nichols. Once upon a time, you had to be six feet tall and 200 LBS to get hired on most police forces. But, that was when we were less enlightened (and the bad guys were afraid of the cops). Oh well, if we’re going to make “social progress,” sacrifices must be made, eh? As a public service, LarryNaselli.com will be offering free language classes for Liberals. During weeks 1 through 7 of the course, we work with students to teach them to pronounce the following three-word sentence: "Bush was right." Of course, remedial courses will be available for pupils who flunk lessons 1 through 7, and grief counseling will be available for those pupils who pass. It's been a tough few months . . . well, years . . . well, make that decade for the Democrat Party. My youngest daughter turns 12 next month, and when she entered the world Democrats controlled the White House, both Houses of Congress, a majority of Governorships and a majority of Houses in the State Legislatures. The Party of FDR, JFK, LBJ and WJC also enjoyed the distinction of being the Party that more Americans identified with than any other. In just over a decade every one of those advantages has been reversed, and about all the Democrats have to show for it is that Bill and Hillary Clinton have escaped from Public Housing to join the swollen ranks of first-time homeowners. The Bush tax cuts have the U.S. Economy humming, and to add insult to injury, very few observers accept the notion that the rising tide of freedom and democracy in the Middle East is a result of chance or inevitability, so that even sophisticated European Newspapers are mulling the once-unthinkable possibility that perhaps "Bush was right." Well, these are the times that try men's souls, and insofar as the abiding arrogance of Liberal elitism permits, Democrats have been searching their souls (or at least their Marketing Consultants' souls) to discover how they can better present their Party to appeal to a body politic in which Democrat marketshare has been steadily declining. One possible approach is Re-Branding. Presumably, the traditional Donkey mascot once projected the desired image for the Democrat Party, but times have changed, and branding must change with the times -- although some might count it ironic that the change the Democrat Party has made is from the Party that changes with the times to the Party that refuses to change with the times, or even to acknowledge that the times are changing at all. For example, the Democrats have now staked their Party Identity on the twin premises that all is well with Social Security, and that U.S. Foreign Policy in the Middle East is a catastrophe. To call this viewpoint mistaken would be generous to the point of dishonesty, because what the Democrats are really engaged in is self-deception; and whatever the pecadillos of Donkeys are, self-deception is not commonly acknowledged to be among them. Since I'm not aware of any animal that would (or even could) stick its head where the Democrats have chosen to stick theirs, the best mascot I can propose for the Party's re-branding is the Ostrich: a noble beast perhaps, but also one that, shall we say, lacks vision, and is peculiarly vulnerable to swift kicks from behind. Quite a good fit, in fact. Ever since the U.S. invasion of Afghanistan in October of 2001 Liberals have been predicting the imminent eruption of "The Arab Street." Well, The Arab Street has finally erupted, demanding the withdrawal of the heavy-handed, unilateralist, imperialist occupiers who have kept Arabs down for so long. Unfortunately for America-hating Liberals, the object of The Arab Street's anger is the totalitarian Baathist regime of Syrian dictator Bashar Assad. As the long-suffering People of Lebanon arise to claim the freedom they have watched the Afghans and Iraqis obtain, you can be sure that the tyrants now running Iran and Saudi Arabia are almost as uncomfortable with the eruption of The Arab Street as American Liberals are.